Organization is a critical component to your success, whether you�re deploying tactical fiber optics for military use in harsh environmentsor monitoring a coal-mining operation. We offer both portable and stationary electric cable reels for studio and mobile units for communication industries such as broadcast media, theater, mining, emergency/rescue, and the military. A complete tactical or broadcast deployment system includes an easy way to quickly deploy and retrieve cable. Hannay Reels manufactures heavy-duty steel, aluminum, and stainless steel hose and cable reel assemblies. 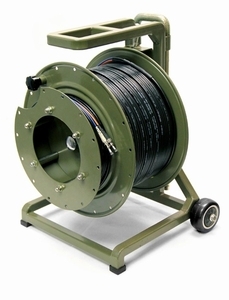 The Modular Advanced Reel System is a lightweight cable deployment reel system designed for the demanding needs of harsh-environment fiber optic installations. Commonly used in TFOCA applications. When you're in the field and you need a durable and easy to use cable reel, Shane Industries cable reels are the right ones for you. Cable reels for personal or business applications.